Many years ago I attended a Scottish Cup Final between Celtic and Rangers at old Hampden. I can still recall my boyish excitement when my old man told me I was going. 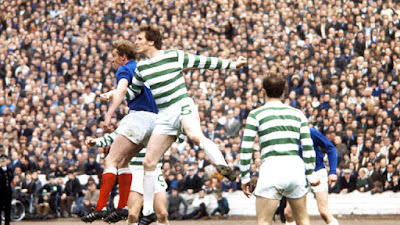 In those days the crowds were enormous for such games with well over 100,000 supporters showing up on many occasions. 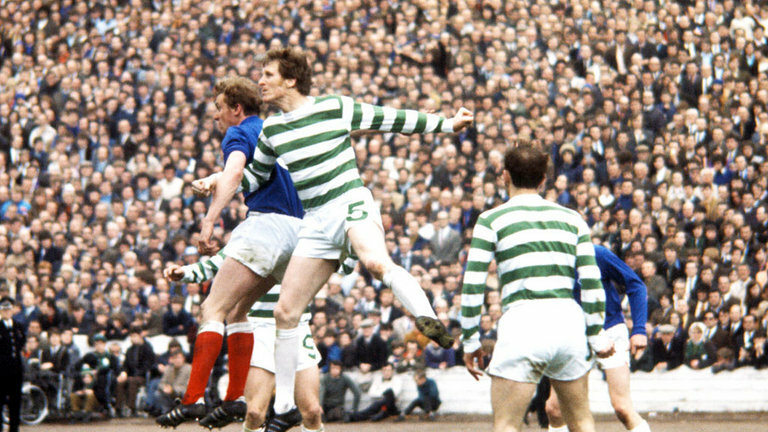 Celtic won on that day long ago and I can recall so much about the noise, colour and passion of the game; it was an incredible spectacle, a real assault on the senses. I also recall two old men I saw that day. The first was high above the celebrating Celtic support in that quaint little north stand which once sat above the big enclosure of old Hampden. I can still see his shock of grey hair and contorted face as he hurled abuse and spat at the Celtic supporters below him. It seemed so incongruous to me to be amid the joy of thousands celebrating a Celtic cup win and yet see the naked hatred on another human being’s face. The other old chap I met outside the stadium after the game as the sheer weight of the crowd pinned us to a wall at the point the Celtic end met the crowd surging down Somerville Drive. There was some sort of disturbance going on which I couldn’t see and the Police where holding back the crowd to allow them access to it. The old fella, who looked well into his 70s, wore a heavy overcoat and a flat cap and was no more than 5 feet tall. There were a lot of these ‘wee men’ in the Glasgow of my childhood; the hungry years of the 1920s and 30s stunted the growth of a generation. His old fashioned Rangers scarf was visible beneath his coat even though the crowd around him was virtually all wearing the green of Celtic. I can still recall him smiling at me, ‘First final, son?’ I nodded and he responded by saying, ‘You never forget your first cup final. Mine was in 1921. We got beat by Partick Thistle!’ We chatted for a few moments; the old fella who’d watched football for most of the twentieth century and the young lad attending his first big cup final. He was a proper old gentleman of a kind which still exists here and there. Both of those old chaps I saw that day are long gone but they taught me a valuable lesson. They both supported their club but it seemed to me that only one had exhibited the sort of bitterness which periodically scars our national game. Each of us makes choices in life about how we behave and express ourselves and how we react in the clannish, antagonistic atmosphere of professional football. Group dynamics can often sweep us along with its pressures to conform. As youngsters we’ve all wanted to fit in and be one of boys (or girls) and acted in ways we’d consider foolish now. That’s part of growing up and most people grow out of it and walk their own path. Some though, seem to lack the wit or will to think for themselves and wander the barren and bitter wilderness of unthinking prejudice. Those two old men at that game long ago taught me that not all Rangers supporters are foaming bigots and that to think they are is in itself a form of lazy thinking. I can recall from that game long ago my old man tutting and muttering ‘Listen to those bastards,’ as songs poured out of the old Rangers end of the ground. I was too young to understand what was being sung about and merely considered the noise to be part of the spectacle. As I grew up and realised that much of the songbook the Rangers support used in those times contained lyrics which could only be described as bigoted by any objective observer, I began to see what irked my old man. Every major club has supporters which let it down from time to time but it seems undeniable that there has been and remains a culture among some of the Ibrox support which exhibits naked racist and sectarian attitudes in a manner which suggests they’ll never change. This hatred is deeply ingrained into some from an early age and the sub culture which supports it finds its most visible expression at Rangers games. Last week I wrote of the scenes at Ibrox during the thrashing Celtic handed out to the home side. Some followers of the Ibrox club went into knee jerk response bringing up photos and incidents when Celtic supporters had misbehaved. They simply couldn’t rise above the ‘whataboutery’ and see that this isn’t about point scoring between the clubs, it’s about the decent fans on both sides calling the racists and bigots out and condemning their antics for the backward and moronic behaviour it is. I’ve written elsewhere about my lowest point as a Celtic supporter which came in 1988 when some of our supporters racially abused Mark Walters but the majority of Celtic fans were on those idiots like a pack of wolves. The ‘Not the View’ Celtic Fanzine castigated them as ‘Racist arseholes’ and this self-regulating mechanism seems sadly lacking at Ibrox. I hope decent supporters of the Ibrox club say ‘enough’ to those who drag their club through the mud. They are the only ones who can challenge the culture of hate which infests their support. They should learn a lesson which Celtic supporters learned long ago; you should be defined by what you stand for not by hatred. Too many at Ibrox still look the other way as do some in the media and among the ruling authorities of the game. Change though, is always possible but as history teaches us, it is more profound and lasting when it comes from the bottom up. We have a long way to go in Scottish society to eradicate such attitudes but we have come so far since that cup final I attended as a boy. Some, it seems are just much slower at realising society has moved on and remain stuck like dinosaurs watching as a comet blazes its way across the sky towards them. You can love your club and not hate anyone. It’s really that simple. As you know, I worked as a missionary steward at the Sunny Dunny for a while. I've seen them picking on supporters of almost every club they played. Agree we're not perfect, but the self policing isnalways good to see. PS When's the next book due? Well written as always. I describe myself as a Celtic fan, not an anti-Rangers fan. In the 70's I remember going along to John Greig's testimonial when they thrashed a Scotland side heading to Argentina (writing was on the wall), to pay tribute to a great player. As a former ball boy at Hampden during the 1980 riot, then at Parkhead in the early 80's I've seen the best and worst of Old Firm supporters. Later on when I was working the turnstiles, I was spat on by Rangers fans when working the Rangers end, then by Celtic fans at the Celtic end at Ibrox, (not realising we were Celtic stewards brought over by the club!) As a 12 year old seeing at close hand grown men knock lumps out of each other that sunny afternoon at Hampden left an impression that has never left me. Support your team with passion and pride and worry about your own standards rather than anybody else's. As Celtic fans we are fortunate to be part of a club founded by immigrants for charitable purposes. Born of a spirit of being all-inclusive and open to change and new ideas. Glasgow, like Liverpool, New York and Boston at that time was not exactly welcoming to the wave of migrants with different customs and religion (sound familiar?) but Celtic gave them an identity and a pride and a hope for a better future. Nearly 130 years on, that hope is still there for the west of Scotland, and as the old cigarette advert once said: "We've come a long way, baby".